G. Nzhdeh (1886-1955) founded the ideology of national unity, which is based on noble idea ancestral morality: the members of the nation, as secondary to their religious and personal political beliefs, will be merged by Armenian factors: "There are no party martyrs and heroes, there are and will remain national martyrdom and heroism”. This notion requires for precious offering from every single Armenian: for sake of Armenian nation and future of Armenia sacrifice his/her self-loving; leaves an order to various parts of Armenians and individual Armenian-born first of all be an Armenian, to remain servant and warrior of Nation-Ethnos despite of partial and religious beliefs, social status and world location. 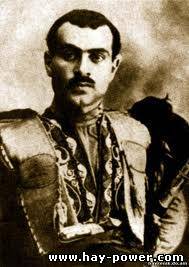 The Tseghakronutyun (nation-ethnical religion) aspires to safeguard our inner amity and reconcile the various strata of Armenian society as "without the supreme pacificator what kind of is Ethnos-Nation, only grave land can bind a conciliation upon the daily spirit-fallen Armenian people”.